« Am I a Sea Biscuit? 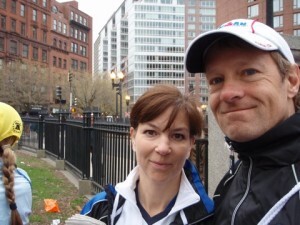 After twelve Ironman triathlons including the world championships in Hawaii, seventeen marathons, and three 24 hour cycling events (one world record attempt and two world records), the Boston marathon on Monday was one of my most memorable races. It was truly an incredible event. 25,319 runners qualified to run the Boston marathon this year by finishing in the top 10% of their age groups in qualifying marathons from around the world. It is indeed a great honor to compete with the greatest amateur athletes in the world. The last time I was lucky enough to compete in a world-class event like this was at Ironman World Championships in Hawaii in 2006 where I learned a very valuable lesson. My goal and sole focus for three gruelling years leading up to Ironman Kona was to place in the top 5% of my division at an Ironman triathon and win a qualifying slot for world championships in Kona, Hawaii. When I placed 4th in my division at Ironman Arizona in 2006, I had accomplished that goal. (the blog report is here) Ironman Hawaii that October ended up being a long and miserable day because I was suddenly goal-less. I had made it to Kona and simply ‘doing’ the race made it almost impossible to push past the agony of the distance, repressive heat, humidity and relentless wind. I really suffered in Kona. So that is exactly what I decided to do. I was going to run this race “balls to the wall” right from the start gun. There are two start waves – the first wave is finishers with qualifying times faster than 3:30 and it started 30 minutes before the second wave. Helen was in the second wave, so I decided that since it was chip timed anyhow, I would just start with Helen in her wave. This meant passing thousands of runners which was quite a challenge with 25,000 runners on the road! I finished the first 10 km in 47 minutes and I was felling pretty good. I started to make deals with myself. “Just hold this pace until 20 km, then you can coast for the remaining 24 km”. I reached the 20 km mark in 1:32 which I was quite happy about. I was starting to feel the pain in my quads from the hills, so my second deal was to make it to 20 miles holding my current pace, then relax for the last 6 miles to the finish line. After 20 miles my legs were SCREAMING at me!! All of the pounding from the hills was taking it’s tole. It took everything I had to block my mind from focusing on my pain, and to keep my pace up. At this point I figured I could possible make it another mile before slowing, so I held onto my painful pace. The crowds in Boston are like nothing I have ever experienced in any race. Non-stop cheering from spectators lining the race route for all 26.2 miles. The screaming and cheering reached ear-plug levels for the last 6 miles with fans 3 to 4 deep lining the course! This was my fuel that got me to the finish line without giving into my agony. The motivating cheers from the crowds in Boston is like nothing I have experienced in any race before. I finished with a personal best of 3 hours, 15 minutes, 51 seconds placing me a humbling 943 out of 2773 in my division and 3422 th over all. Helen had a great race also and broke 4 hours. Denis Waitley said “You must learn from your past mistakes, but not lean on your past successes.” I try to learn something from all of my races, and recording the lessons in this blog is a great way to retain the education and possibly help others who might be in the same boat. Training for the Boston marathon was to be a bit of an experiment. I was still injured with a sore calf and hamstring from last summers 24 hour HPB (human powered boat) record attempt, so I decided to ease back on my run training distances leading up to Boston. I am also training for another shot at the HPB record for sometime this summer, and I didn’t want to sacrifice any of my bike training with additional running that might further injure my hamstring and jeopardize my HPB record attempt. I limited my running to one run per week which was my long run – and limited my intensity to VERY easy. My longest run was 3 weeks ago, and maxed out at 3 hours at a very slow pace. The following week I did a 2 hour fast run at race pace with short rests every 30 minutes, then last week a 1.5 hour very fast run. That was it aside from about 12 hours a week spend on my bike. Typically when training for a PR marathon, I will run at least 4 times per week consisting of a short distance speed intervals workout, a tempo workout, a moderately fast long run and at least one easy recovery run. According to conventional training wisdom, I was VERY under prepared for Boston. Yet, I ran a personal best. Go figure. I think the lesson in this is to not underestimate the power of a good, multi-year base, and fully rested and recovered legs. I now appreciate the true power of a “less is more” strategy in a training program. Congratulations to you and your wife for the marathon. I read your description with great interest. I too ran a personal best in Boston, being equally under-prepared as you put it. However, I think as people get older they need to rest more, it helps. I also read something else that I find very interesting and that was in your Hawaii write-up too. It appears you do better when you set firm goals and try to beat time goals. I find that this does not work for me at all. I do much better when I am more relaxed, and convince myself that I am just running the race for fun. The more I obsess about the race, the worse I do. I went out to IM Canada last year, just for fun. I ended up setting a new PR there. And the same happened in Boston. Anyway, congratulations on your PR!